An article outlining the Ninja's Godai 5-Element Model. As is so often the case when dealing with multiple personality types, egos, and the need for instructors to justify their positions and philosophies, the question went unanswered. What followed for several days was a sidebar discussion about the "rightness" or "wrongness" of a particular teaching model. In short, the poor student's question went unanswered. What follows began as a brief attempt to help the student resolve his dilemma and, eventually, turned into a three-part series. The metaphysical lore of the East is, quite logically, intertwined with the arts associated with the Shadow Warriors of Japan. Often, the influences are obvious, as in the use of the Shinto ceremony of respect and acknowledgment used to open and close classes; others, like the 5-element classification systems are not as apparent. This is a system based on, and leading up to, the rokku-dai “Six Great Elements” as used in esoteric Buddhist study. The elements of the Godai are often, quite erroneously, confused with the elements that make up the Periodic Table used in the study of chemistry in Western science. I even remember a time when I was in school and one of my science teachers, who was covering the base elements at the time, laughed quite condescendingly about how the people of the Orient believe that there are only “Five” elements and, naming the above, pointed out the “real” 81 (at the time). ...the Western system can actually be reorganized and classified using the Godai system. The Elements as Classifications of "Groups"
“Earth” — represents the firm, hard objects that appear in existence. Rocks are probably the best symbol of the earth element in nature in that they are incapable of change, movement or growth, without the help of the other elements. In the human being, the “earth” element shows up in the body as the bones, muscles, and other tissues. In the mind, it is confidence; and emotionally it is a desire to have things remain as they are; a resistance to change. When under the influence of this chi or earth mode or ‘mood,’ we are aware of our own physicality and sureness of action. As a means of self-protection, which is based, as are all of the strategies of the ninja’s art of operating with natural laws, on the student’s emotional level or mood when the attack starts. "Earth," as a code for Enlightened Self-Defense action, represents our desire to hold our ground and ‘crush’ the assailant’s attack with our strength. We are calm and unbothered by their threats and we firmly resolve to stop them in their tracks. In the self-protection strategies of the ninja’s armed and unarmed combat arts, the ‘water’ element identifies both our defensive adaptation to the enemy’s attack and our ability to ‘flow’ with their actions. The feeling of being overwhelmed by their force or technique causes us to want to back up and create more space and time between ourselves and our assailant, as we attempt to cover and protect our targets from their attacking limbs. The “Fire” — as a code, this symbol represents those elements in a combustible, or energy-releasing state. It also symbolizes force and direction. Animals are a good example of the ‘fire’ element in that they are capable of movement and direction, though limited by primitive ‘programming’ or instinct. In our bodies, this element is represented by our metabolism and body heat. Mentally, it is our directness, commitment and desire to be better than we are. Internally, from our heart come the qualities of will or intention, motivation and competitiveness as well as an outgoing or domineering spirit. As a defensive strategy, ‘fire’ represents our committed spirit directed against our opponent as we take the fight to them. In reality, there is no such thing as a ‘fire’ technique per se — just as there are no water, earth, etc. techniques. There is only our energy level or emotional mood that causes us to move-in against the attacker. “Wind” — is the symbolic representation for elements in a gaseous state. Freedom-of-movement and an expanding nature are the keys here. Again, apart from the naturally identifiable ‘things’ alluded to by it, the ‘wind’ element is best symbolized by human beings. Human beings, in their lower or most common states of development, are capable of movement, direction and have intellect; the trait necessary for development, growth and overcoming the limiting tendencies of programming and the primitive instinct from our ‘animal’ nature. In our body, the ‘wind’ element is our respiration and the processing of oxygen and other gasses between cells. Mentally, it is our intellectual capabilities and our ability to be ‘open-minded.’ Emotionally, we are carefree and not influenced by stress. As a basis for self-defense, this element shows in our desire to evade, and stay just beyond, his reach. We naturally want to avoid any conflicts or, at least, a direct confrontation. Our strategy is reflected in our turning and evasive movements that allow us to flank him and smother his assault attempt if necessary. The “Void” — is the code for the sub-atomic or ‘creative’ foundation of all that is. Actually, the term “void” is probably a bad translation when compared to the definition of what this element represents. The English language word “de-void,” as in the absence of any pre-determined shape or character, is much closer to defining the nature of this element. Human beings in a higher conscious state are the representatives of this element, just as the sub-atomic material which forms the atoms that group into the molecules which, themselves then, form all other material things in the universe, is the base example from nature. In our bodies, the ‘void’ element is represented by our ability to think and communicate with others. Mentally and emotionally it represents our creative nature, as well as our personal means of self-expression as we identify with and operate in the world around us. 1. Our communicating with the attacker in an attempt to diffuse the situation before it becomes physical. 2. The creative and spontaneous flow between the lower elements as we adapt to and alter our techniques as our emotional state changes from moment to moment. We literally ‘make-up’ the technique as we go. 3. Our ability to ‘let go’ of any pre-set techniques or mental chatter about “what we will do if he...,” and clear our mind so that we can see and pick up the sense-impressions and feelings that will tell us what he is doing or preparing to do to us. 4. The application of Kyojitsu Tenkan Ho or the strategy of altering the attacker’s perception of truth and falsehood. Our ability to make the attacker think we are doing one thing when in fact we are doing the opposite is key here. The Godai elements, as codes for action in a self-protection situation, serve as a guide for the student, not in learning set techniques or kata as such, but in relating to their emotional moods and responses, and their influence over the student’s mental and physical options. It must be remembered that, as human beings we have a ’natural’ way of learning effectively and efficiently. A physical, hands-on approach, coupled and followed by theory leads to an emotional feeling about that which we have learned. This feeling could be good (we like it), bad (we dislike it) or neutral (we neither like it or dislike it.) Unfortunately, we deal with stress (read: fights) in just the opposite way. First we experience an emotional response about the situation, encounter, environment, etc. Based on whether we are attracted or repelled, etc., we form a mental strategy based on what we know and what we think we can do, and finally we go into action. Though taking several sentences to describe, the actual impulse to response time takes only a fraction of a second. Beginning students, more often than not, do not understand the defensive strategies implied in the techniques being learned, let alone have an awareness of their emotional state at any given point. The Godai then, is a model that can be used as an expedient - as an example of the Enlightened trait known as "skillful means" - to help explain the modes in which we operate, their prompters, and the possibilities available based on what the body is, and is not, capable of when under the influence of each emotional state. Students who engage in the Warrior Quest Intensive come away with a very powerful, working-knowledge of the Godai 5-elemental codes as models for both self-protection and personal empowerment. In part 2 of this series, we will examine the Gogyo 5-Elemental Transformations as a guide for learning the ninja’s survival, escape and evasion methods, and in gaining an understanding of the advanced strategies which can make the ninja warrior seem like a wizard and reader of people’s minds. 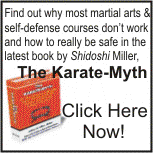 Subscribe to Shidoshi Miller's Online Ninjutsu Training Newsletter and get ongoing information about training, personal development, and the power of the Ninja's art directly from one of the most respected leaders in the art today. 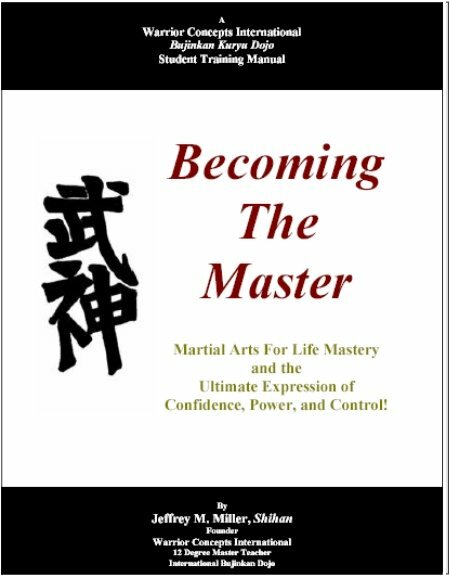 When you subscribe today, Shidoshi Miller will include his newest ebook for you, "Becoming The Master!" This one-of-a-kind training resource outlines the first 5 levels of Mastery in the art of Ninjutsu as taught by a certified teacher of the authentic Ninja arts of survival and personal mastery. In it, you will learn exactly what skills and abilities you will gain as you progress through the Shodan to Godan (1st through 5th degree) black belt levels of this powerful martial and life mastery system! ...and begin receiving your newsletter and all of the great "extras" that come with being a subscriber. Go ahead and enter your name and primary email address now. Shidoshi Jeffrey M. Miller is the founder and director of Warrior Concepts International, an expert in the realms of real world self-protection tactics, and a master teacher in the art of Ninjutsu - the art of the Ninja. He is highly sought-after for his direct, often politically-incorrect approach to helping people get what they need. Through his classes, seminars, book and video products, and corporate training events, he empowers individuals with the time-tested and proven concepts, principles, and closely guarded secrets of the warrior in a way that makes them highly effective in Today's world.